The truck you want is now easier to find following the launch of TradeTrucks.com.au, a new feature-rich used equipment classifieds website from Trader Group, publisher of Australasian Transport News, Owner//Driver, SupplyChain Review and Deals On Wheels. There are over 8,000 items already listed on TradeTrucks, with plenty more to come. There you will find around 8,000 items already listed, with plenty more to come. The website is the one of eight new classifieds websites unveiled by Australia's leading publisher of transport and machinery titles. The new sites will offer consumers easier ways to find earthmovers, farm machinery, plant and equipment, trucks and buses, cars, boats and motorcycles. TradeTrucks.com.au is the online extension of Trader's market-leading print products, Deals On Wheels and Owner//Driver, both of which have maintained strong circulation and classified advertising volumes in the face of the gradual shift to online. In the most recent CAB audit period to June 2012, Deals On Wheels achieved a powerful 2 percent year-on-year surge in paid circulation to 22,998 per month; while Owner//Driver's monthly circulation was stable at 37,886 in the September 2012 CAB audit. 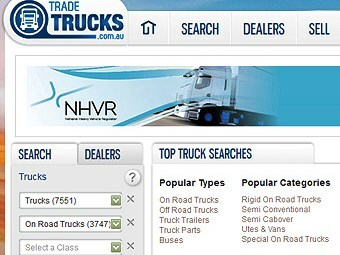 For those who utilise print and web, TradeTrucks.com.au offers the best of both worlds, quickly and easily delivering thousands of the used trucks, trailers, parts and accessories advertised for sale in print in Deals On Wheels and Owner//Driver online, in an intelligent searchable database that puts buyer and seller together fast. Utilising industry-specific databases, built by transport industry specialists, each website will make it easier for users to search for the widest range of stock. All listings are sortable by make/model, type, sub-type, manufacturer, mileage, price and location, and allow for multiple combinations to make finding the equipment you want that much easier - 24/7. In addition, the website will leverage the unrivalled editorial resources of Trader to provide visitors with exclusive access to news and reviews of equipment for sale, including many industry-leading on-road video tests produced by our team of experts. Once you've researched, searched for and compared that perfect truck, trailer, part or accessory, you can choose a variety of ways to contact the seller, whether by email, mobile site or unique number - be it a dealer or private advertiser. Importantly, for buyers on the move TradeTrucks.com.au is also available in mobile and tablet-friendly versions. For sellers, too, TradeTrucks.com.au delivers significant benefits. Backed by an extensive marketing campaign leveraging Trader's unrivalled suite of print and online titles, plus a national outdoor, regional radio and unrivalled level of web advertising, the new site continues Trader's commitment to helping deliver dealers a wider audience for their stock. BusNews.com.au, ChainMail.com.au, NewBussearch.com.au and NewTruckSearch.com.au, comes from organic search - that is, outside its core print readership. Using the next-generation TraderAds2 dealers will be afforded one place to create advertisements and manage inventory, the ability to publish advertisements across multiple channels, including print and online, third-party websites, social media and much more. From January all online advertisements will run until the item is sold. Trader will also offer a range of standard features inclusive of: market valuation, sales trends tools, recent selling prices, and a specific valuation for the latest addition to the lot. Also included is a complete inventory management tool that can produce customised reports showing both current and historical trends. This unique combination of print and web adds up to a richer, more user-friendly and powerful tool for both buyers and sellers, according to Trader CEO Keith Falconer. "With a collective audited circulation of more than 80,000 copies a month, Trader's print titles remain the go-to for buyers of trucks, trailers, parts and accessories. "And given the average reader is a 50-plus-year-old male, we expect this to continue for some time yet," Falconer says. "However, the launch of TradeTrucks.com.au is in line with our strategy to offer our unique content, whether that be editorial or advertising, across all available channels - print, web, tablets, mobiles - and let the customer choose."